The Hot BBQ is the spicier option. The spiciness comes from five different chilis that bring out a terrific flavor with a subtle kick. The sauce doesn’t call for any warning signs because it’s just spicy enough. The Jävla Sås Bolag Hot BBQ Sauce goes great with fajitas or tacos. Try mixing it 50/50 with cremé fraice to make a killer dipping sauce or enjoy it with some fried chicken wings. 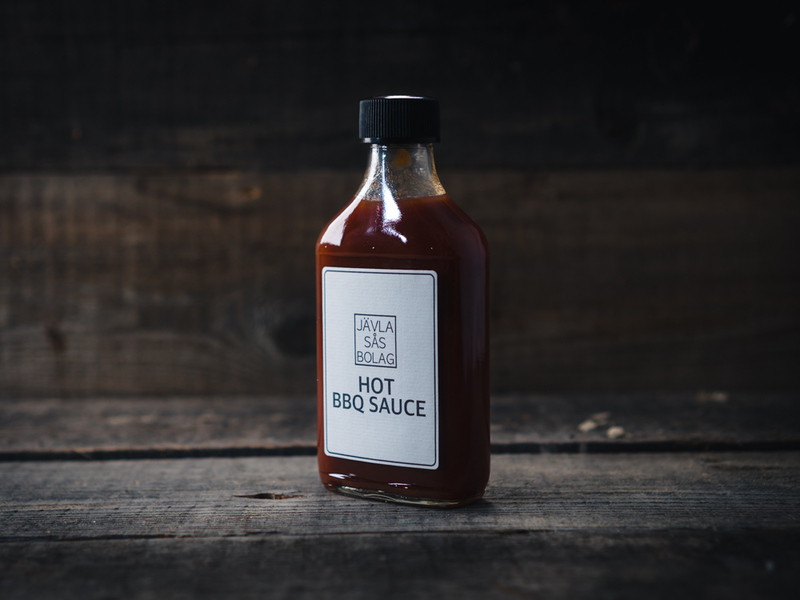 The Jävla Sås Bolag Hot BBQ Sauce – for when you need that extra kick in your sauce! INGREDIENTS: Black pepper powder, Mustard powder, Potassium sorbate (E202), Tomato flavored tomato, tomato paste, syrup, brown sugar, water, salt, vinegar, pepper powder, garlic powder, chili powder (Chipotle, Jalapeno, Guajillo, Ancho, Cayenne).